If you are looking for a totally modern look for your nursery then the Moderno 4 Piece Crib Set will certainly give you that look. Beautifully custom made from high quality fabric in the USA. The Moderno crib bedding set has neutral tones of black, white and grey with apple green trims. 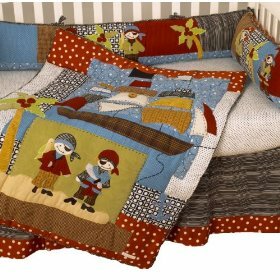 Just think of the fun you can have with this crib bedding which can be dressed up with a variety of accessories in any shade you can think of and it will look fabulous. 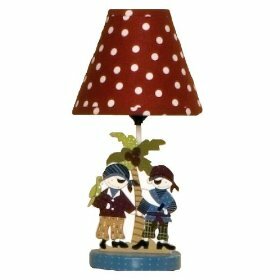 Toss a few scatter pillows in bright vibrant colors such as red and yellow and this set will even accessorize nicely with colorful wall posters of Mickey Mouse or Winnie the Pooh . The Moderno crib bedding set is washable in cold water. bumper – 1 piece zipper bumper. The Moderno crib set is also available as a 3 piece set. Prices range from $545. 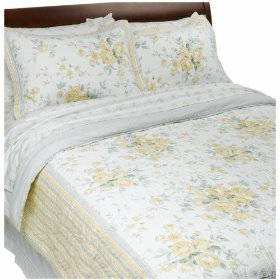 Over the centuries our bedding evolved as civilization has advanced. To begin with there was only the ground and rocks to sleep on. Thousands of years ago our ancestors were more concerned with staying alive than where to rest their heads at night. They slept where they could on the ground as long as it was safe. As civilization advanced though the ages so did our bedding as we progressed from the bare ground and animal skins to sleeping on piles of straw and roughly woven blankets. Yet, there was still a problem of sleeping on the cold damp ground and fighting off the bugs. As our ancestors settled into communities and developed the skills of husbandry, it wasn’t long before they were weaving blankets, stitching them together and stuffing them with wool, feathers, and straw. And Lo and Behold the first primitive mattress was created! Once a basic mattress had been designed, the next evolution in bedding was getting off the ground. The first mattress frames were just an elevated platform. This eventually gave way to a wooden frame with ropes woven through it. It worked but the user had to constantly tighten up the ropes to keep it from sagging. It was from this crude arrangement that the saying ‘sleep tight’ originated. Mankind finally emerged from the dark ages with the invention of wire springs and coils. Not quite what we are used to seeing today though, these coils were built into the bed frame while the mattress, remained as just a woven blanket stuffed with feathers, animal hair or straw which rested on the springs. Later in the 1900’s when mattresses began being manufactured they often had bugs in the stuffing even though they were new. If you mother has ever said to you “goodnight, don’t let the bed bugs bite’, well now you know where that saying came from. One of the greatest advances of civilization was the invention of foam padding. This padding could be wrapped around the coils and springs to make a fully self-contained mattress that rested on another set of box springs. It truly was one of the greatest inventions in history. Our beds are still evolving though. Thanks to technology we now have beds that are filled with water, electric fully adjustable beds, and even memory foam developed by NASA, the same people who explore the universe. The modern waterbed was designed by Neil Arnott and given to St Batholomews hospital by Sir James Paget, in 1873. Long term bed ridden hospital patients often suffer from pressure ulcers and it was to treat and prevent these bed sores that Arnott desiged the waterbed. It wasn’t until after the invention of vinyl in the 1960’s those waterbeds really became popular. We’ve come a long way from sleeping on rocks. There are hundreds of choices available. All that’s left is to for you to find the perfect bed to give you a great night’s sleep! But even the very basic mattress beats sleeping on the hard ground. Whether you are the one who always has people at your house or you are always on the road traveling, one thing that is vital to have is a place to sleep. If you’re the destination house, you don’t necessarily want to have beds sitting in every room waiting to be used, year round. And if you’re the traveller, you don’t have room to carry a regular bed with you. So what can you do? Buy an AeroBed Premier Classic with Comfort Zone Coils which was developed to provide you with extra bedding when you need it. The AeroBed Premier Classic with Comfort Zone Coils was created to not only be an inflatable bed option for you, but it is can also be adjusted to suit people with sleep issues. 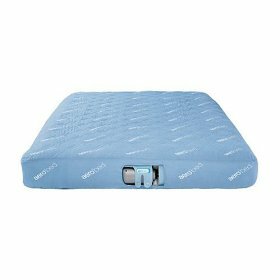 With an attached pump, it is built so that you can adjust the pressure in the mattress, meaning that you can make sure that it’s strong enough to support you for a good night’s sleep. When you need to make an adjustment, it has a Comfort Control Wand that will let you adjust the amount of inflation to get the support you want. Additionally, the AeroBed Premier Classic with Comfort Zone Coils has been constructed to be able to be used with any of your standard sized sheets. That means you don’t need anything extra or special to make the bed and get ready to go to sleep. It’s pretty easy to adjust to various levels of inflation. It comes with a soft plush mattress cover that can be removed and washed which is very nice from a hygiene standpoint. The mattress inflates and deflates in 60 seconds. Includes a thick washable mattress pad for comfort. When not in use, the mattress can be rolled and stored in the bag that is provided. It is really low to the ground (only about 8 inches deep) so it may be difficult for some people to get into. Are you are a mother to be and regularly finding yourself uncomfortable when you sleep? Perhaps you toss and turn and try to get comfortable, but you feel that parts of you just aren’t supported as well as they should be. Well the Leachco Snoogle Total Body Pillow was developed to give you all the support and comfort you need at this time. Additionally, this pillow comes with the added bonus that it can be easily cleaned. 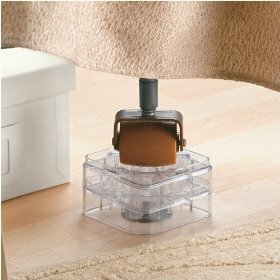 It comes with a polyester foam core and an outer pillow area that can be removed and washed to keep it clean. 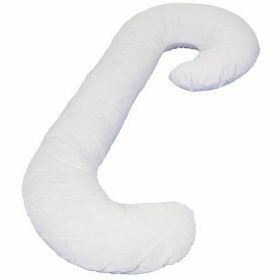 It’s a very firm pillow that can add a lot of support where you need it. It can be twisted and adjusted to offer comfort all over. It stays in place instead of constantly having to try and readjust a lot of individual pillows. If you are not used to using very firm pillows this pillow may not be a good choice as it may take som time to get used to it. It takes up a lot of the bed because of its size, so if you have a smaller bed or share a smaller bed with someone, it may not be ideal. 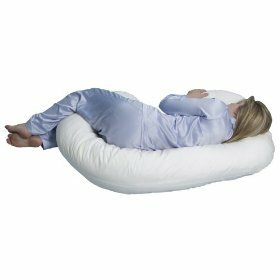 On the whole the Leachco Snoogle Total body pillow is well liked by the majority of women who use it during their pregnancy.